Alright. there are many points I could make about the experience I just had but this is the one (ok, maybe two) I'm choosing. 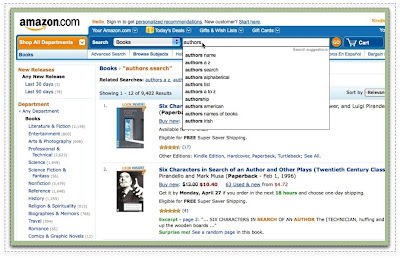 Amazon doesn't have pages for authors and this is confusing and problematic for people. The best evidence I can give you without doing some user research is found right on the site in plain view, so why haven't they fixed it? This is what I discovered while trying to find a list of books by a particular author. You can't click on an Authors name and get a list. 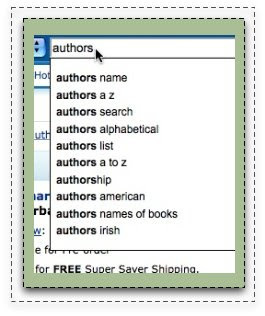 Some of the big Authors names are hot and these took you to a search results list, not an Author page. This is kinda good but really actually bad because it breaks the pattern. If one Author name is hot, they should all be hot or you start to think you are going crazy. I thought...this can't be right, maybe I'm missing something (please tell me if I am). So I search for Authors and look at the suggestions! I'm sure these are generated by the most commonly searched terms. Now being in the web industry I can see a few reasons why they do this, but what seems so interesting is that they have diverted so far away from creating an experience that mirrors the physical world. Book stores are organized by author. I wonder what the larger impact of all this is? Whatever the impact, it is lame and annoying. boo.